Following a months worth of bench marking tests of the three main vendor high-end wired headsets available to Lync (optimised devices). Below are the details on the devices and information around the benchmarking criteria plus my unbiased opinion. With what is now tradition, i will be using the same metrics/categories as i have done in the past with other Lync headset/devices reviews completed. I will score each headset on the following metrics, plus also giving an unbiased synopsis including RRP pricing guide. Sound quality of Music playing– this is something new I’ve added to the reviews and i would say it isn’t something i would use as the main driver for buying or not buying a headset on. The reason for adding this is on my other blog posting at NorthernLync in the past, i have had people asking me about using a Lync headset to listen to music between calls. Personally i don’t think any optimised Lync headsets were manufactured to be a dedicated music playing device, but as I’ve been asked the question I’ve added it into the review anyway. Sound – It has to be said from the start of this review, all the headsets had the sound quality marked as excellent. For the Jabra i found the inward sound to be crystal clear on Lync calls. Also i had comments about the clarity of the outward sound. On a few occasions the recipient of the call did ask if i was the only person working in the office as they couldn’t hear any background noise whatsoever. Also on the odd occasion where i was not talking i had the end recipient saying ‘hello’ back at me as the headset almost felt like to them it had put the call on mute and as described by one caller as ‘pure silence’. That said i was impressed with the sound quality for day to day Lync calls. Sound quality via Music playing – I found it a odd experience and maybe this was due to listening into one ear only, but I think the music lacked bass, and high pitch tones on some songs played. Also it was a little bit ‘tinny’. Functionality – As well as good call quality sound, the BIZ 2400 comes armed with a ‘puk’ sized device attached to the cable. On standard day to day use this is were you would alter the volume and mute/answer calls. The wheel function in the middle endlessly turns and a in-ear clicking noise on rotation is heard. One the secret weapons the BIZ 2400 does have in its armour is within the same Puk device that holds a bluetooth receiver which allows you to pair with your mobile phone and allow for using your headset to make and take mobile phone calls. neat eh!! well hold on a second… it is a neat feature until you close your lid of your laptop, or turn / lock your desktop.!! at this point the bluetooth dongle in the PUK looses the power and without a inbuilt battery it stops working.!! Also i should note the boom arm also rotates a full 360* which i guess is a feature but not something i would play on as part of promoting the product.? Unbiased Verdict – I was moderately impressed with the BIZ2400, and would recommend it to customers who were biased towards Jabra and who was in the market for a high end device. ALSO Jabra tells me there are 20 different types of this headset to suit different scenarios, so if your in need of a custom/different headset requirement its worth looking on their website. Sound – The sound quality with the Blackwire 720 is excellent as you would expect with any premium high end device. There are some really nice additions to the features for sound on this device which makes it a more preferred headset over the Jabra. See below. Sound quality via Music playing – Now if you want a headset for Music playing, then this and the Sennheiser below are the ones to choose. The Blackwire boasts stereo sound which came across as a really full crisp sound on playing a variety of music types. (sorry I didn’t try it on heavy metal), but for ‘day to day’ music it sounded great even through the single ear.! AND a feature which i thought was brilliant was the fact that when you was playing music and for whatever reason you took off the headset, it would pause the music automatically. If there was a very small negative to take from all the great functionality is that the bluetooth range isn’t particularly vast. I can only get to 3 metres from the mobile phone before the sound became choppy. Usability – I love it, i would be happy to use this headset day in day out, both for calls in quiet and noisy places. It also comes with a formed padded carry case to provide a good level of protection. Unbiased Verdict – I can’t state enough i think this is one of the best wired headsets I’ve ever used with Lync. The features are top notch, the sound is excellent for calls and music. This headset without doubt will be going into my kit back for client recommendations. RRP – less than £100 at this moment, which makes it £30 cheaper than the Jabra BIZ2400. In my opinion i would be going for the blackwire over the BIZ2400 even if the pricing was the same. For me Its a no brainer going for c720 over the BIZ2400. Sound – What can i say, by default the sound quality of all the Sennheiser devices spreads though there product range. The SC630 isn’t an exception to this as the audio quality is high-end. Sennheiser states that the Audio is HD audio which i do agree with. Sound quality via Music playing – As with the the Plantronics Blackwire device, the Sennheiser headset also sports the concept of allowing for high quality stereo music. this it does really well, and i would say it is a better sound on music playback over the Plantronics. This music sounds rich and clear. Functionality – As well as the excellent call quality of the sound for calling and Music, the Sennheisers SC630 build quality is to a high degree using premium end materials. The look and feel of the headset ouzes premium grade quality. Although the functionality isn’t on the same level it terms of gadgetry, Sennheiser has chosen to go down the build and quality road to give the end user the best sound and device quality experience. Below are some of the features detailed from Sennheiser on the SC6xx devices. Unbiased Verdict – If you want a excellent sounding audio headset which is as good running Lync calls as music playing, plus with a excellent build quality then the SC630 is the one of choice. RRP – As this device is relatively new to the Lync market, the price point is the highest of the three devices at £149 per headset. That said, that old saying goes… you get what you pay for and with the SC630 its high-end quality throughout. Overall Verdict and Star Ratings. I enjoyed using all the devices i tested and reviewed, they all did what i expected them to do. Also it was refreshing that i didn’t have to write any negatives about the devices. If i had to choose a winner and a preferred device of choice, based on build quality and sound preferences i would suggest the Sennheiser SC630. 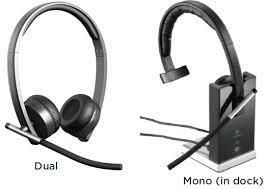 If you was wanting more technical features along with excellent sound quality to match then the Plantronics c720. Sadly i think out of the three headsets the BIZ2400 just didn’t cut the mustard in both in build quality or technical options. ***Also to note, all of the headsets were tested with Office for Mac Lync as well, and all preformed as expected. Thanks for reading. the next device review will be around the mini conference devices. The below is a unbiased view on three dect headsets that are all certified and compatible with lync 2013 and Lync 2010. Using the same metrics/categories as i did with the bluetooth device review, i will score each headset on the following metrics, plus also giving a Pros and Cons synopsis including RRP pricing guide. Sound – There is one thing to say with all the Sennhieser devices I’ve used and reviewed ALL have the best sound quality across the UC field. Again like the Sennsheiser bluetooth Presence device the sound quality is crystal clear. I’ve been using a DW office now for many months, and as the other two dect headsets have been released i’ve used these other devices for weeks at a time but it must be said its never ever been in my mind to replace the DW office. Simply put, its head and shoulders above the Logitech dect headset for sound. I’ve used this dect device in my daily job accepting calls from SIP connections/PSTN and Mobile and the device has never missed a beat. Functionality – As with all three headsets they all almost mirror each other with basic functionality with some having nice little extras over the other. For me the Sennheiser has a couple of neat features. One – being that it does not need a power supply to feed it an electric current. Its happy to utilise the USB connection to the headset to power it. (its worth noting this is the only dect headset in the review which can do this). Two – the device can also twin and connect to a desk-phone for better together capabilities. 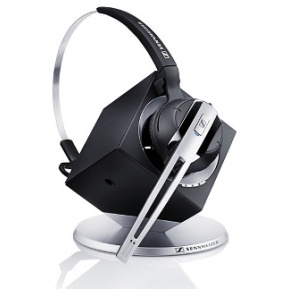 Three – you can twin unto 4 headsets to one base station. (this works well for training purposes etc), Four – it can be connected to your mobile/cell phone as well as a Lync headset. Usability – I can sit with the headset on for hours and even sometimes i forget im wearing it until I’m reminded :). there is comfort and quality all around this headset. On first opening of the box, you might find the boom arm is very close to your cheek, this is by design and within the box is what Sennheiser calls a cheek deflector which is a little piece of plastic which snaps onto the start of the boom arm and makes the arm move away from your face area. The ear peice is leather and very comfortable to wear. Unbiased Verdict – the quality is what you would expect from Sennheiser devices. excellent sound and build. I wish it had a ringer in the base until as this would be in my opinion be the perfect all round product. Price point of this dect headset is the most expensive and could be seen as to expensive by some. Sound – When i first saw this headset at the UC Expo in London in March, i couldn’t wait to get one of these devices to test and ultimately use in my day to day job. Oh how disappointed i was with this device when i received it. The sound is just awful, the boom arm and mic is super sensitive to the point where you can’t stop the sensitivity. (this is the same with the USB wired version). You literally have to move the flexible boom arm to a right angle to stop the sound distortion. Even with turning the sound down to the minimum setting within Lync makes no difference. Functionality – Barring the sound issue, functionally the headset has a unique feature of showing the incall presence at the backend of the boom arm, this in itself is a nice feature when the headset is in use, people can see your on a call. As with the Sennheiser device, this dect device also doesn’t have a ringer option within the base unit. When the headset isnt being used you dock the headset vertically back onto the base unit, and there has been a few times where i thought it was docked but due to it being placed into the dock misaligned, it never charged and wasnt good enough to use on my next call. Unbiased Verdict – I can imagine the Logitech guys sitting round a meeting room table and saying ‘we have X amount of budget how do we use it…’, i think they spent 85% on comfort, and the remaining on the actual base unit, headset and packaging. If there was one saving grace for the logitech device its the price, its unbelievably cheap for a dect headset. You wont find a cheaper dect headset on the market. Downside is the sound, its a massive issue with this headsets.. Sort the mic sensitivity Logitech!! fix this and you will have a great UC device at a very good price. Sound – The sound from this headset is really good, nothing really to complain about. On using it i hear no white noise and distortion, and the difference between the Pro 9470 and the Sennheiser DW office is the DW’s sound is more digital and clear. That said if id bought the Pro 9470 i would be happy to use it day to day. Functionality – In terms of design of both the base unit and headset are both nice. i like the base unit lcd touch display which enables you to flip connections from desktop to bluetooth/mobile phone. ALSO it has the ringer which i really like and one i see customers asking more and more for. As for the headset it fits nice with large leather ear pads, and it also feels light on your head. Usability – I used the Pro 9470 device of choice before i received the DW office. If the sound was just a little bit clearer i would be hard pressed to choose between these devices. I cant emphasise enough about the ringer feature and how useful it is. Unbiased Verdict – This is a really good bit of kit, and one i would recommend to a client. There is nothing i can fault. This is a relativity simple verdict, and if you see this as gold, silver and bronze awards. In third place is the logitech h820e this is because of its poor sound offering. 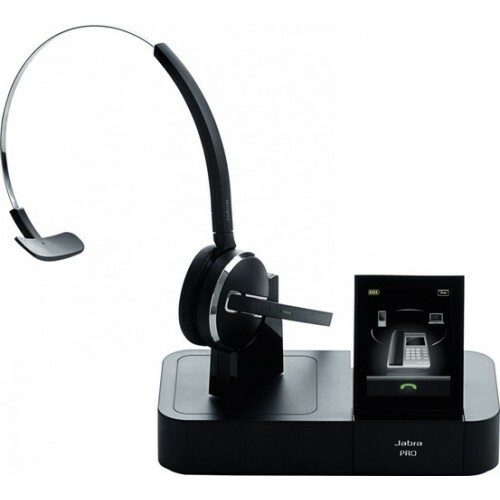 In a joint first place is the Jabra Pro 9470 and the Sennheiser DW office. Reason why i cant make a distinction between these devices is due to the following. For the Jabra Pro, i cant fault the device in anyway, i like the base ringer option, and the base lcd touch display. Plus the device is £100 cheaper than the sennheiser DW office. For the Sennheiser DW Office I can’t get away from the quality sound and hardware. Also with the ability to add additional headsets to the base units, its perfect for training purposes. Downside for me is the price, you have to have deep pockets to afford a few of these if you are a customer.